For a few years now I've been reviewing Australian comics, graphic novels and books of cartoons for Inkspot, the magazine of the Australian Cartoonists' Association. In #52, the latest issue, (also available online), I review Sarah Ellerton's fine manga-influenced fantasy saga Inverloch, along with George Haddon's Victoria Sketchbook and, because Haddon was such an influence on me as a kid, I thought I'd mention the latter here. 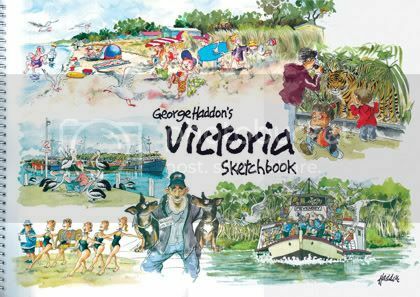 George Haddon's Victoria sketchbook by George Haddon; edited by John Hall. This huge book is a journey through my home state of Victoria, featuring many of my favourite places - an excellent reminder of all that’s here, as well as a beautiful artbook in its own right. George Haddon's ink and watercolour centrefolds have been a feature of Royalauto (the members’ magazine for the Royal Automobile Association of Victoria) for many years now, with this series centring most of all on his artwork. The high quality reproductions of his artwork in Victoria Sketchbook positively glow. Reproduced at A3 on high quality paper, Haddon’s pen and brush illustrations evince the tangible atmosphere of a place and time - the people, the buildings, the scenery, the activity. Haddon has a long history of illustrating location sketchbooks, so is the perfect artist for this material. For people who know Victoria, among the places featured in Victoria Sketchbook are everything from the aquatic delights of Anglesea surf, Rosebud beaches, Murray riverboats, the bays of Lakes Entrance and Port Campbell; the historic townships of Beechworth, Clunes and Swan Hill; inner-city vistas of Carlton, St. Kilda and Williamstown; the heights of The Dandenongs, Mount Macedon and Mount Hotham; and the wilds of Marysville, The Grampians and Phillip Island. 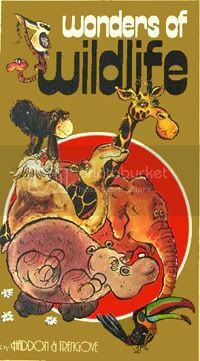 My personal favourite will always be Haddon & Trengove’s Wonders of Wildlife, which appeared many years ago in The Herald. I treasure a book collecting those classic strips (I used to cut them out, but have long since lost my collection, and not all of them are in the book). It’s wonderful to have a new Haddon book to add to my collection!